This review contains spoilers for previous books. War is coming–and every leader of every realm has sided with the War Emperor and pledged to fight the Karrak invaders–apart from Taggie, the teenage Queen of Dreams-to-be. Aided by an unusual band of allies, including a Karrak Lord, an elf and a feisty skyfolk captain, Taggie knows that the only way to stop the war is to find the long-lost gateway between our universe and the dark universe: the home of the Karrak people. But how much is Taggie willing to lose in her desperate quest for peace? 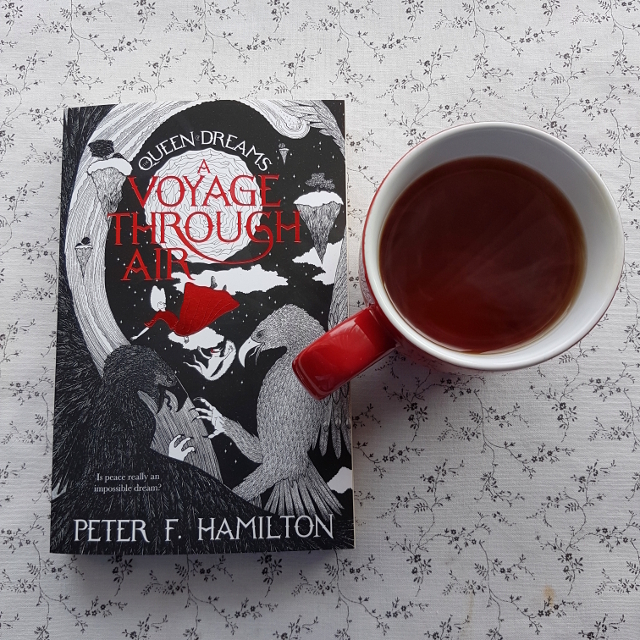 A Voyage Through Air is the final book in the Queen of Dreams series and is a suitably epic conclusion. It’s not a book that stands on its own, particularly since it carries on more or less immediately after the previous book. There’s a bit of recap, but it’s hard to say how effective it is. By the time A Voyage Through Air starts, there’s a reasonably large cast, containing both ongoing characters and some new faces, and it could be a lot to process for younger readers. I’d definitely recommend starting from the beginning of the series and enjoying all the fun. Taggie and Jemima, two sisters from the ordinary world, are in fact royalty in another realm. Upon taking up her rightful throne, Taggie faces an assassination attempt by a previously-unknown cousin. This was part of a large-scale plot to assassinate the princes and princesses of all the magical realms. The Kings and Queens blame the Karrak Lords, denizens of a dark universe who were trapped in our light universe a thousand years ago. They decide to go to war, but Taggie is determined to find a peaceful solution. A Voyage Through Air centres on her quest to accomplish this by locating the hidden gateway between the universes. The worldbuilding is more whimsical than realistic. The First Realm, where Taggie rules as the Queen of Dreams, is an inverted sphere with land around the outside and the sun in the middle. While it’s nice to see an imaginative new take, sometimes I felt that differences existed just for the sake of being different. This was particularly the case with the elves and the dragons of the world. For example, the dragons found in the Realm of Air look significantly different to the popular conception of dragons (being described as more like giant manta rays with two tails) and refer to themselves by a completely different name. It therefore seems strange to tie them to dragons at all–which the narrative does by presenting them to the sisters as dragons and repeatedly affirming how much the creatures hate being called that. The changes to the elves make a little more sense, pushing back at the traditional uptight, milk-white portrayals. However, this is undermined somewhat by a lack of diversity in the remainder of the cast. Captain Rebecca is introduced in A Voyage Through Air as a dark-skinned skymaiden–the first the reader has seen. In fact, she’s the first dark-skinned character at all, apart from the elves, making it feel tokenistic. It really is too little, too late. The story itself is an epic adventure, as the sisters and their friends attempt to retrace the course their ancestors took a millennium ago. There are air ships, monsters and battles on the land and in the sky. The narrative occasionally gets bogged down in description, but the style is nicely visual and is aided by a few illustrations scattered throughout the book. The language may be a bit of a challenge to younger or more inexperienced readers, but I’m not a good judge of that. It is a good book for readers who aren’t fond of romance. There’s some in the background for Taggie, but it’s generally downplayed. Instead, the focus is on friendship and adventure. All in all, I found A Voyage Through Air a light and reasonably entertaining read.